The Challenger Explosion: Where Were You? Twenty-five years ago today, I was student teaching at Santa Cruz High in Santa Cruz, California. Across the nation, schoolchildren sat glued to television sets in their classrooms, prepared for a short break from the usual curriculum, to watch Christa McAuliffe fly past the stratosphere. I was teaching algebra and, as I recall, there was an audible roar in the halls when students, watching the liftoff live, gasped in horror. As my class was starting, the campus was abuzz. 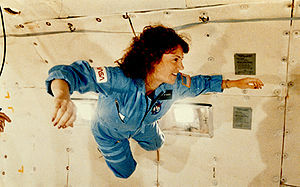 Christa McAuliffe was NASA’s first choice to fly as part of the Teacher in Space Project, a program encouraged by Ronald Reagan to inspire kids to study science. As students filed into my class, they had just seen the shuttle explode, and were literally in shock. The administration closed the school for the day and sent everyone home. Kids were in tears, and I was somewhat in shock. I don’t know that my students learned anything from me, on that day or any other, while I was a student teacher; I mainly learned that I probably should not become a teacher. But looking back on it, I wonder what lessons there were for students that day? Since then I’ve become a fan of Henry Petroski‘s writing, and believe in his idea that failure inspires invention. What did those kids learn from the Challenger explosion? Did they learn something about human fallibility? Did they learn how important testing was? Did they learn something about risk? I was too young to teach the students those lessons then, but I hope that some of them have, upon reflection, learned something from that sad day. How about you? Where were you when the Challenger exploded, and how did it affect you? I’d love to learn where you were twenty-five years ago today. This entry was posted in Personal, Science & Technology and tagged Henry Petroski, postaweek2011, Space Shuttle Challenger, Space Shuttle Challenger disaster. Bookmark the permalink. 3 Responses to The Challenger Explosion: Where Were You? I was in middle school. I didn’t see the explosion live and did not believe my friends at first. It was truly inconceivable to me that it could happen. The political cartoon that ran in the Sunday paper was a picture of God’s hands, open, cradling the shuttle. Just thinking about it makes me start to tear up. I cut it out and saved it. I think it’s in a box with other childhood memorabilia in the attic. If you find it in the attic, you should scan it and write about it. I can imagine your disbelief, because it was just shocking to see that, and so many kids were tuned in watching. I was working in a small diner and watching it on TV, and being totally in shock about it. I’m not sure if it was the same day, I think it was, I also remember feeling the building shake as a big truck went by so thought nothing of that, only to find out it was an earthquake. In Cleveland, Ohio of all places. My world was rocked/shifted in a few ways that day.